Our final set of tests are a little more on the esoteric side, using a tri-GPU setup with a HD5970 (dual GPU) and a HD5870 in tandem. While these cards are not necessarily the newest, they do provide some interesting results – particularly when we have memory accesses being diverted to multiple GPUs (or even to multiple GPUs on the same PCB). 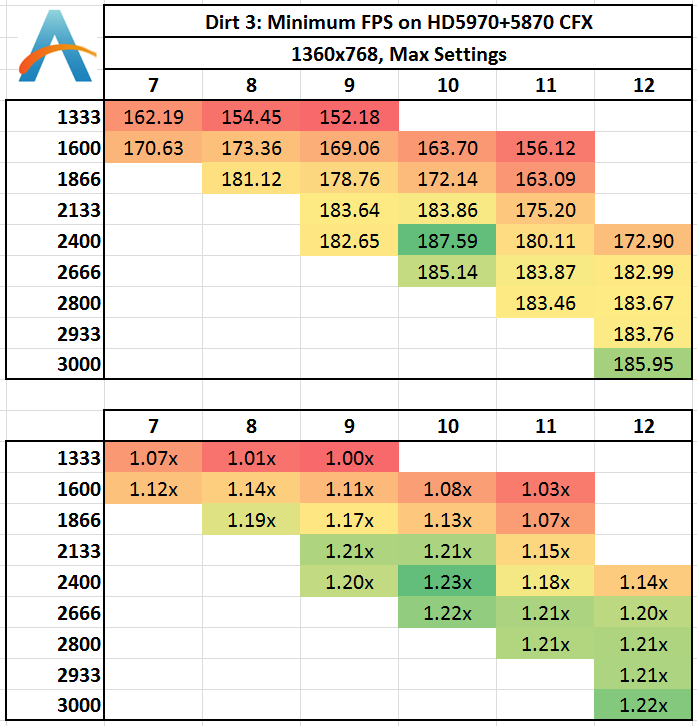 The 5970 GPUs are clocked at 800/1000, with the 5870 at 1000/1250. It is pretty clear that memory has an effect: +13% moving from 1333 C9 to 2133 C9/2400 C10. In fact, that 1333 C9 seems to be more of a sink than anything else – above 2133 MHz memory the performance benefits are minor at best. 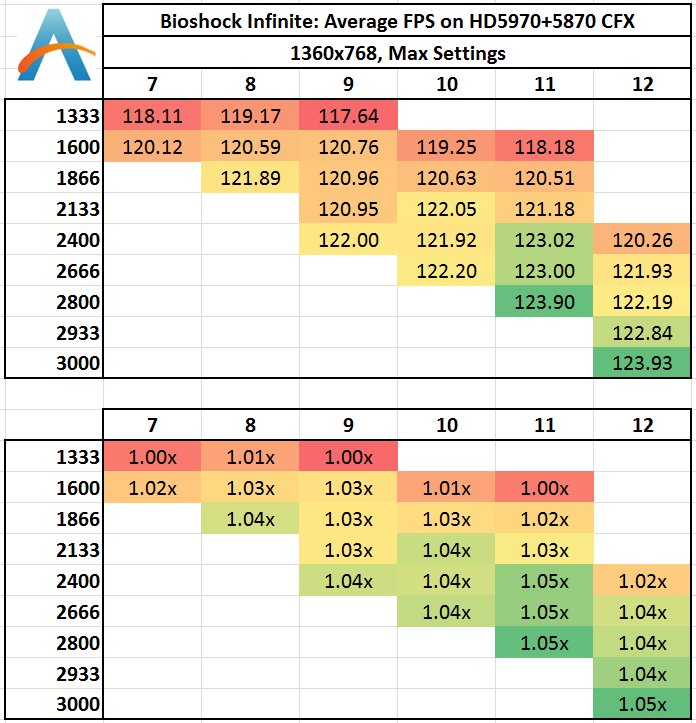 It all depends if 186.53 FPS is too low for you and you need 200+. 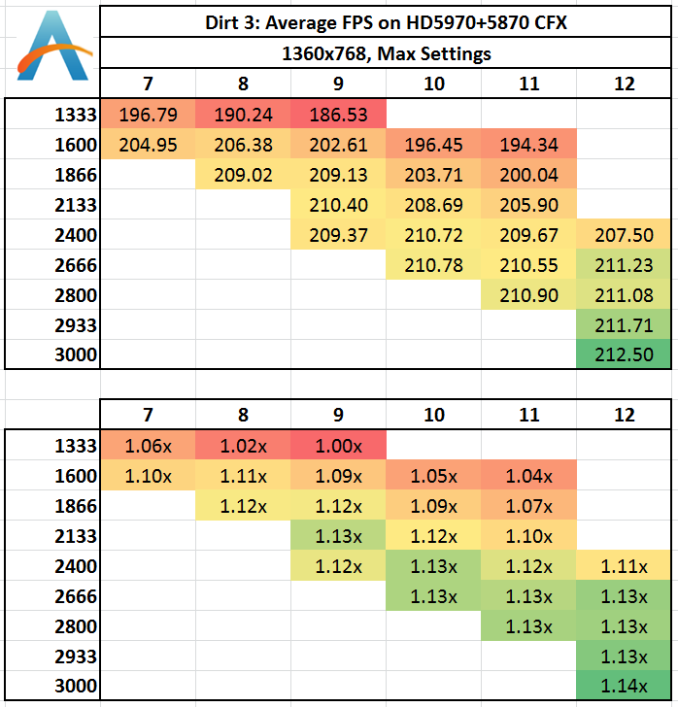 We see a similar trend in minimum FPS for Dirt3: 1333 C9 is a sink, but moving to 2133 C9/2400 C10 gives at least a 20% jump in minimum frame rates. While differences in Bioshock Infinite Minimum FPS are minor at best, 1333 MHz and 1600 C10/C11 are certainly at the lower end. Anything 1866 MHz or 2133 MHz seems to be the best bet here, especially in our case if we wanted to push for 120 FPS gaming. 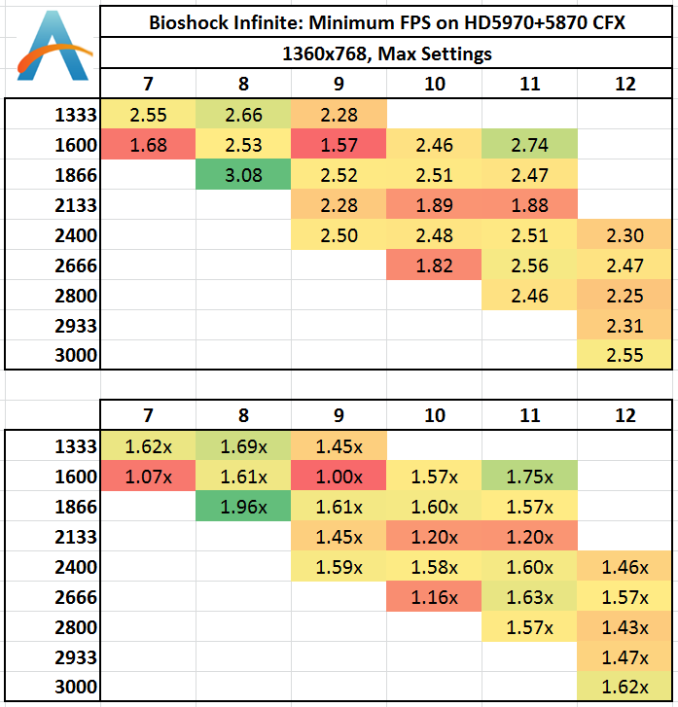 Similar to Bioshock on IGP, minimum frame rates across the board seem to be very low, with minor differences giving large % rises. 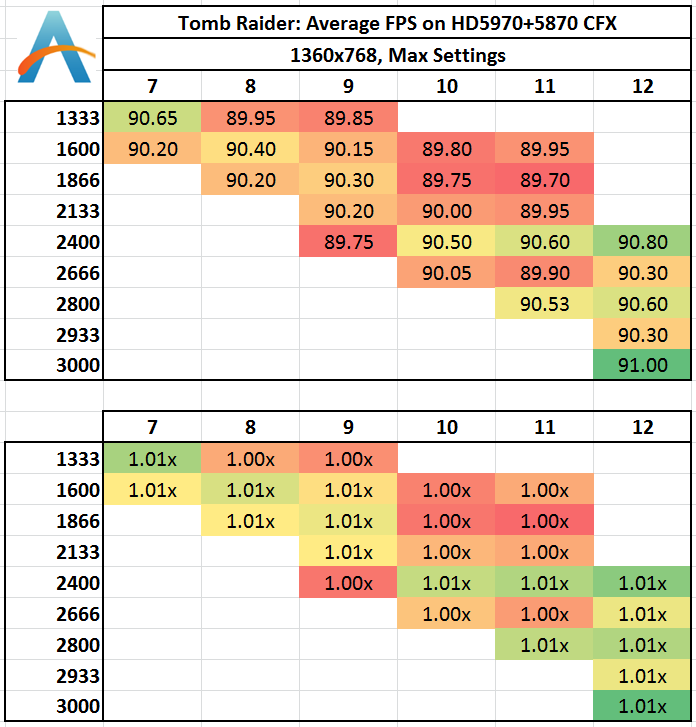 Tomb Raider remains resilient to change across our benchmarks, with 1 FPS difference between the top and bottom average FPS results in our tri-GPU setup. With our tri-GPU setup being a little odd (two GPUs on one PCB), Tomb Raider cannot seem to find much consistency for minimum frame rates, showing up to a 15% difference when compared to our 1600 C10 result which seems to be a lot lower than the rest. 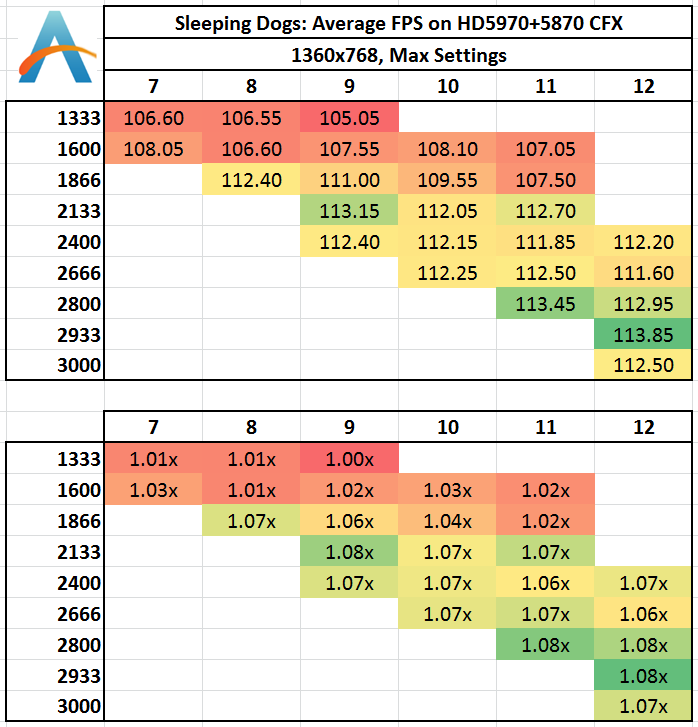 Similar to other results, 1333 and 1600 MHz results give lower frame rates, along with the slower 1866 MHz C10/C11 options. Anything 2133 MHz and above gives up to 8% more performance than 1333 C9. 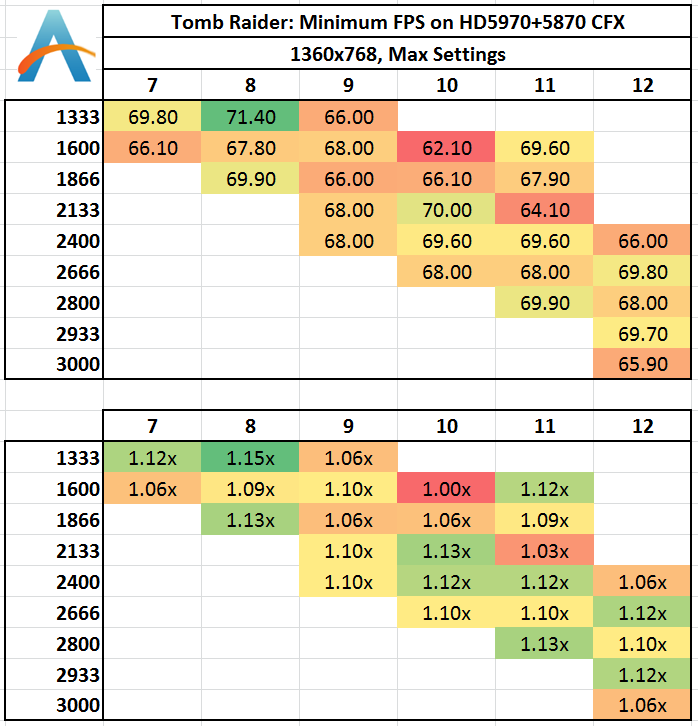 Minimum frame rates are a little random in our setup, except for one constant – 1333 MHz memory does not perform. Everything beyond that seems to be at the whim of statistical variance. Memory Scaling on Haswell: Single dGPU Gaming Pricing and the Effect of the Hynix Fire Memory Scaling on Haswell: DDR3-1333 to DDR3-3000 Tested with G.Skill Enabling XMP with ASUS, GIGABYTE, ASRock and MSI on Z87 Memory Scaling on Haswell: CPU Real World Memory Scaling on Haswell: CPU Compute Memory Scaling on Haswell: IGP Compute Memory Scaling on Haswell: IGP Gaming Memory Scaling on Haswell: Single dGPU Gaming Memory Scaling on Haswell: Tri-GPU CrossFireX Gaming Pricing and the Effect of the Hynix Fire Conclusions: Do you need a 3000 MHz C12 memory kit?